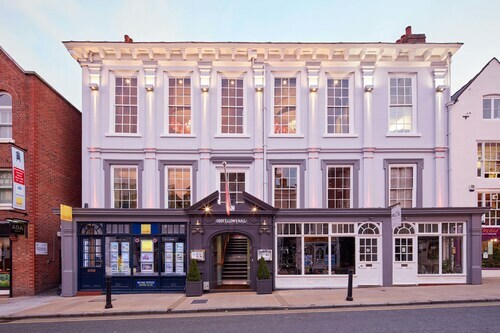 Situated in Chester, this spa hotel is within a 15-minute walk of Grosvenor Park and Chester City Walls. University of Chester and Chester Racecourse are also within 1 mi (2 km). Chester Station is 7 minutes by foot and Bache Station is 29 minutes. 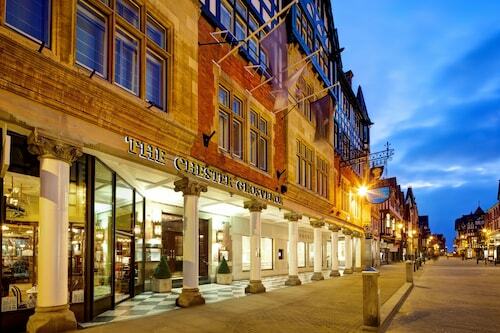 Situated in Chester, this spa hotel is within 3 mi (5 km) of Chester Cathedral, Chester Zoo, and Grosvenor Museum. Countess of Chester Hospital and Chester Castle are also within 3 mi (5 km). Chester Station is 29 minutes by foot. 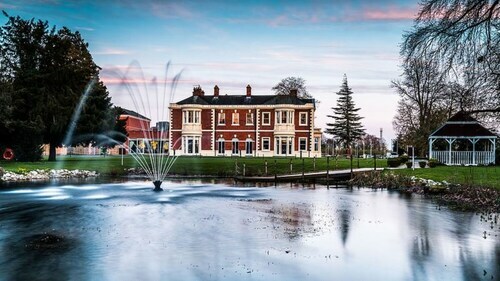 Situated in a rural location, this spa hotel is within 6 mi (10 km) of Chester Golf Club, Chester Racecourse, and Chester City Walls. University of Chester and Grosvenor Museum are also within 6 mi (10 km). How Much is a Hotel Room in Marchwiel? Hotels in Marchwiel start at $65 per night. Prices and availability subject to change. Additional terms may apply. On the hunt for a place to rest your feet right by the bright lights of Marchwiel? Within an easy commute to central Marchwiel, there are 6 suitable hotels. One of only a small number of lodgings near the centrally located attractions of Marchwiel, is the Cross Lanes Hotel. 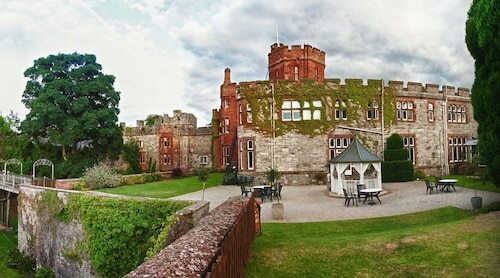 The The Chester Grosvenor can be found about 12 miles (19 kilometers) from the center of Marchwiel. Another hotel is the Edgar House, which is positioned 12 miles (19 kilometers) away. An alternative option is to book a bed at the Peckforton Castle or the Abode Chester. Still looking for things to do? Spend a few hours visiting Valle Crucis Abbey and Llangollen Bridge, which you'll find in Llangollen, 12 miles (19 kilometers) to the southwest of Marchwiel. If you're planning to head to Llangollen, check out the rooms at the Bridge End Hotel and Wild Pheasant Hotel. Or, you could consider staying in Prestatyn, 30 miles (46 kilometers) northwest of Marchwiel, where you have the options of the The Beaches Hotel and Prestatyn Sands Holiday Park. If you stay in Prestatyn, make your way to the Prestatyn Beach and Talacre Lighthouse. Get yourself a serving of sport by making the trek to Old Trafford, which can be found 40 miles (66 kilometers) to the northeast of Marchwiel. Modern travelers that are hoping to book Travelocity-listed accommodation near to the action can choose from the Dreamhouse Manchester Bloom Street or the The Lowry Hotel. John Lennon Airport is a major gateway for those flying into Marchwiel. It is 20 miles (36 kilometers) from the center of the city. For travelers who would find it convenient to find accommodation nearby, check out Crowne Plaza Liverpool - John Lennon Airport or Hampton by Hilton Liverpool John Lennon Airport. The staff was not helpful and insisted that I could drive my car into a nearby garage. Their directions could not be followed without me going the wrong way on a one-way street. When I came back to the desk I explained the issue and asked again,my impression from their response was that they were dismissive, lazy and inept. I walked out without checking in because I was totally put off by the front desk. I would never recommend this hotel. Wonderful hosts, helpful and accommodating. Convenient location, walking distance to historic Chester. We stayed here for a few nights in early June. We had the family room, which is in the attic, and the stairs go on and on. When you think there can't be anymore stairs, there's more! We weren't expecting air conditioning, but this room is on the top floor and has only one very tiny window, so it was very hot. Even with the weak fan that was provided, the room was too hot to sleep in comfortably. I booked the option that had breakfast included, through travelocity, but they charged me for it anyway. My wife and I, together with a friend who was travelling with us arrived early and were more than happy to leave our bags and check in later. But, the new owner Paula, greeted us in a warm and friendly manner and told us that our rooms were ready and we could have them immediately. The rooms were very clean and comfortable. The bed was very comfortable and provided a good nights sleep. Breakfast was very good and we chatted a bit with Paula. She is very friendly and, while new to the running of a guest house, appeared to be doing an excellent job. We will definitely stay there again on a future visit to Chester. The location of the guest house was also excellent. We were literally two minutes from everything. 4.0 Excellent place to stay! The food was fantastic. The peacocks were fun to watch. They had baby chicks and the male showed off his plume constantly. The staff was great! We stayed here for 5 days at the end of 2008. Faciltiies and location are good, but it is definitely not what a seasoned traveler would expect from a 5 star hotel. The quality of service was very mixed - ranging from genuinely helpful to curt and perfunctory. The front desk seemed incapable of ensuring that our key cards were consistently activated throughout our stay and seemed less than concerned when we had (on 3 occasions) to trek all the way back to Reception to remedy the issue. A strange smell (which could only be described as matured cheese!) pervaded the corridor on which we were located throughout our stay. We don't believe it represented value for money and would not stay again.